What is Hair Testing for Heavy Metals & Minerals? 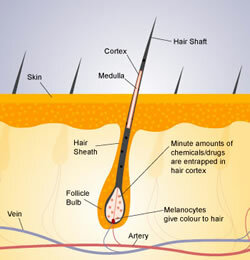 It is a screening test to measure the levels of toxic and mineral elements using hair tissue. It has been used in laboratories for over 80 years by doctors. Hair can provide up to three months worth of information on your body’s cellular and metabolic health. Reduces guesswork for diet and supplements. Provides a window into the cells. Information about metabolism at the cell level. A nutritionist can use this analysis to monitor a supplementation program and to make necessary changes according to your individual biochemistry. Detects toxic metals that may be part of the root problem to your health issues (heavy metals are linked to A.D.H.D., heart disease, cancer, diabetes, mental issues, etc). A sample of hair is taken from the recent growth of hair on the nape of the neck – 1 tablespoon is necessary- tagged with name, and date. The sample is sent with a patient information sheet to the lab where it is analyzed using highly sophisticated equipment. A computerized summary of the results and levels of the elements present are printed out for both the practitioner and patient. This type of testing is extremely accurate and can detect in the range of ppm for minerals and for trace elements.